Architecture in Minutes, by Nibweb member Susie Hodge, is a chunky little book intended for anyone who is interested in architecture and wants to know more, or who simply wants to refresh their knowledge. Highly illustrated, it’s an accessible guide to the history and theory of architecture, and explores a broad range, from the earliest structures to some of the latest concepts and developments. Included are details about significant buildings, historic styles and movements, and information about celebrated architects from various periods and of different nationalities. 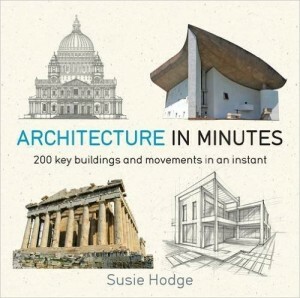 It includes details about the Greek orders, Roman engineering, Gothic architecture, the Renaissance, the Baroque, Revivalism, Art Nouveau, Modernism and Postmodernism, Futurism and Dynamic architecture along with architects like Inigo Jones, Christopher Wren, Gaudí, Frank Lloyd Wright, Le Corbusier and Frank Gehry – and loads more.